Stained towel, what made it? - We are your AirBnB hosts forum! 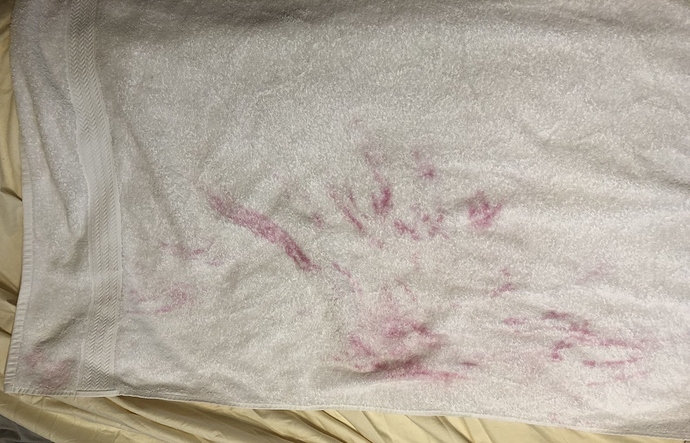 Stained towel, what made it? This is that third time in a little less than 4 months that we’ve found towels like this in the house after a guest checked out. Every time it’s a reddish color and every time the towel was left in the bedroom, not the bathroom. It has a very mild perfume/sweet scent and it did wash out the first two times (this one hasn’t been washed, yet). But… WTF is it? My guess is the stain is from electronic “vaping” cigarette smoke that is sold in different flavors and scents. Your guests could be holding the electronic smoking device in a towel, as they inhale the flavored liquids. What did the guest say @Brian_R170 ? I’d like to know too as I’ve never seen a stain like that. Ever. that’s very strange that you’re getting it monthly, and from different guests. Sometimes it’s not worth chasing the guest about stained towelling, it’s often suggested that it’s just part of hosting, but we’re all very curious about what can cause your stains. The towels are less than $4 each on sale at Costco and it washed out previously, so no reason to chase the guest about it. There were 10 guests in an extended family that came from different cities around the country for a family event (quinceañera). My wife and I are now thinking it’s temporary hair dye. There has always been women in their mid-20’s staying in the house when this happened. I had a woman stay here with blue hair and she got blue on towels and pillowcases but it did eventually wash out. That’s hair dye I’m pretty sure. Someone just had their hair done. If you’re having it happen that often, you should get “bleach safe” colored towels and leave them in a basket in the bathroom with a note about what they’re for. They’re colored so they hide this kind of stain but you can wash them with bleach and they won’t get stained from that either. Its gotten to the point where I leave a note out titled “Ladies” and I address some issues like removing make-up with make-up remover wipes instead of towels. I don’t think I added something about the towels but this doesn’t happen that often to me. When it does, I try to wash it out. It comes out mostly but leaves a faint pink hue. Then I put these towels in my “second string” rotation. Just my experience as a host but I can tell when some guests are going to be a bit rougher on the towels than others so I give them my grade B towels to take the hit. After a few wash cycles, the hair dye fades and the towels either go back into the regular rotation or they’ve already been really torn up by guests. I use 100% ringspun long staple cotten towels from St Mortiz. They’re pretty nice and about $7.50/ea (excluding shipping) if you buy them by the dozen. More stuff washes out of these than the Costco cotton or other cheaper cotton towels so these do last longer. My room rates aren’t to the point where I can afford to throw towels out after every guest though. Wash cloths, sure, but not the towels. My room rates aren’t to the point where I can afford to throw towels out after every guest though. Wash cloths, sure, but not the towels. Friendly reminder here that old towels can be donated to animal shelters who never have more than they need. So by the time one buys a towel and deducts it from their taxes, uses it a few months, donates it to charity and deducts it again (if you have enough to still itemize) and/ or uses it again as a car wash towel, dog washing towel, or for your own use in your bathroom, towels are not expensive. I was going to say it’s hair dye. I color my hair red and it comes out on the towels. I always use a red towel that I don’t mind staining but after this I have to really dry my hair well because this dye could get on shirts, pillow and really everything and doesn’t come out. My wife is a professional hairstylist and beauty salon owner. She says, it must be hair dye. But the same red stain, among three different guest stays, is odd. Are there red stains on the pillow cases, too? She also suggests having dark-color guest towels to hide future stains. dark-color guest towels to hide future stains. The problem with this is that dark colored towels show the bleach from benzoil peroxide face care products. And some people think white towels communicate a cleaner and more professional rental. I started with colored towels for the same reason as everyone else. We’re not hotels/I want it to be homey/it’s what I already have on hand. But through reading here, experience and considering that every single hotel uses white, I switched to white. It’s always been reddish colored, but not exactly the same color. This is actually the darkest one. My wife says it was also on the bedding the very first time it happened, but not as much as was on the towel. Just FYI, it the red color washed out completely from the towel. My wife pre-treated it and then washed it by itself. Thanks to me rebelling against my old mum, who was the ‘it won’t show the dirt’ type, I prefer white everything. Remember those horrible multi-coloured floral bedspreads they used to have in hotels? Those patterns were hiding a multitude of grim stains that no-one would want to sleep under. I use white everything in the rentals (including shower curtains, bathmats and bedspreads) which assure guests that everything is properly clean and hiding nothing. I use 100% ringspun long staple cotten towels from St Mortiz. Where do you order them from? Nathosp.com. They only sell by the dozen. Looks like the price is up to $8.25/towel before shipping now… I get the 22 lb/dz at 35x86". Any bigger or heavier than that is a waste because it takes up so much more laundry resources to clean. Any smaller/lighter than that isn’t really luxurious. I definitely wouldn’t do the 17 lb/dz because thats like a motel towel. They only ship signature confirmation. Annoying… bad customer service too. I have 2 dark waffle weave hair towels(by aquis I believe) that I had embroidered with the word “Hair”, and I have a stack of dark washcloths embroidered with the word make-up on them. The rest of my towels are white. I started this because my daughter started dying her hair fun colors a few years ago and her towels were getting trashed.